Every Tuesday we have open meetings to study the fundamental principles of Spiritism, including the Gospel According to Spiritism and the Spirits' Book - 2 out of the 5 books of Kardec's codification. It is our spiritual moment, where through the studies we connect to the spirituality, also through prayers and sending our good thoughts and vibrations to those in need. There is also the moment of "passes" - a transfer of spiritual energy given by a non-contact laying on of hands that restores the person's spiritual balance. If you are planning to visit for the first time, please send us a note or call for more information. This meeting is for adults only - for kids' activities please see information below about Youth Spiritist Education. Arrival time: 6:50pm. The door will be closed at 7:00 pm. A combination of meditation and a special time to share our feelings. Come to relax and connect with our Spiritual guides through meditation and to open our hearts in an informal setting with no pressure or judgment. A time when we can feel that we are part of this Spiritist community and work on strengthening ourselves. 2nd part: 30 min of "Heart to Heart"
Our Book Club meets every third Wednesday of the month to discuss a book or part of a book related to Spiritism. The purpose of our book club is to promote the study and discipline through reading. The purpose is to inspire us through the process of artistic work in a climate of fellowship and mutual support. We will have different activities, such as knitting, drawing, painting, etc. All are welcome, including teenagers accompanied by a parent. No previous experience is necessary, only open mind and goodwill! Hope to see you there! Please get in touch with us to receive a list of supplies. We meet at 10:15am and activity starts at 10:30am. 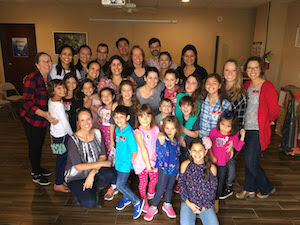 Every second Saturday of the month Kardec Spiritist Group of Austin visits the Austin's Children's Shelter for a morning of fun and interaction with children that were rescued from abuse and neglect. There are about 50 children and youth today at ACS, most of them are between ages of 12 and 18. Study of the Gospel According to Spiritism and Passes. This meeting is for adults only - for kids' activities please see information below about Youth Spiritist Education. The youth curriculum integrates the Spiritist Doctrine teachings into practical lessons that can be brought into their everyday lives. The activities consist of lectures, games, movies, current events and other useful applications that support this doctrine. We offer two classes for ages 5 to 9 and 10 and older. Anyone who undergoes a difficult time due to physical, psychological and/or spiritual imbalance can find in the fraternal counseling the necessary support. Spiritual Assistance is a spiritual treatment through prayers, guidance and specific passes followed by spiritually magnetized water. It is a treatment that also requires the person to continue working on his/her inner transformation. Kardec Spiritist Group of Austin offers different levels of courses on Spiritism to study more deeply the principles of the Spiritist Doctrine, as well as its practice in our every day lives. New registration opportunities are open from time to time, so more information on schedule and type of course will be on our site as they are available. How can I help my group?